Flipping legion BoEs has always been a quick and easy way to churn out gold throughout the expansion. Market has dried down a bit recently, but it's still profitable despite the low prices. The market is very unpredictable and setting up the perfect TSM 3 filter can be difficult. Below is a method that can help you find the best deals to flip with easily. These two searches will give you all 101s above 835 and all 110s above 850 so you can easily ignore the crafted i835 gear and any other irrelevant results. 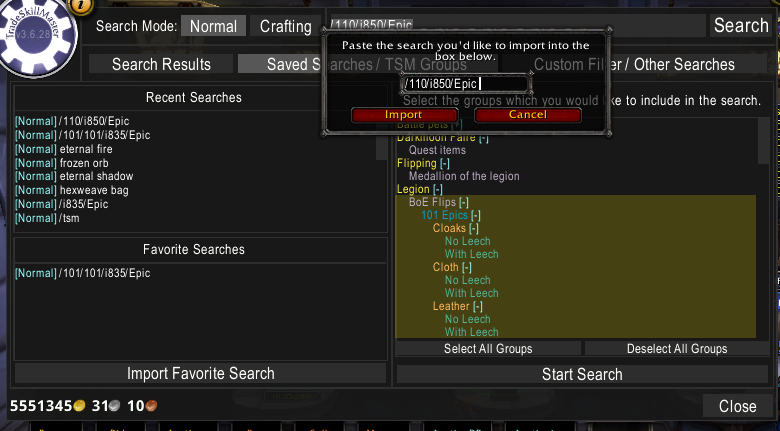 This has drastically sped up my search times as I used /101/i835/Epic before which returned all items above required level 101 and item level 835. Using groups to search for deals is horrible due to the massive amount of variants of each item and none of the main approaches works well in practice. I'll give it a go. Thanks. Thank you very much, appriciate it!